Chief Executive Officer (CEO) of the Nevis Tourism Authority (NTA) Greg Phillip says he is satisfied with the success of The Nevisian Mango Feast. It was held on July 12, 2015 at Oualie Beach. He gave the assurance that the Authority would host the event again in 2016. In an interview with the Department of Information on July 15, 2015, Phillip said the event went well and as many as 200 persons patronized the event. “Everybody who came seem to have been very pleased with the quality of the food they sampled. The food was of every type needed to create a full course meal from appetizers to desserts. “Based on the success of this year’s feast, our plans are to host the same event next year with a number of new initiatives to make it even better,”Â he said. In an invited response to whether the Authority’s objectives were met, Phillip said he was confident they were. 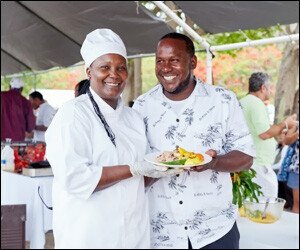 The Feast was held as part of the NTA’s second annual Nevis Mango and Food Festival in the month of July, in an effort to create an event which celebrated and highlighted the talent and creativity of local culinary professionals and to add texture to the Festival. Phillip thanked their chefs for their partnership and the various establishments they worked for. He also expressed gratitude to Rams Supermarket for its sponsorship of the Feast and said the event would not have been possible without their assistance. The NTA Executive also thanked Jazzique who provided musical accompaniment, for his musical prowess, owners of the Oualie Beach Resort for use of the venue, the Department of Agriculture who provided Mango Smoothies, a popular crowd favorite, and all who patronized the Feast. The Nevis Mango and Food Festival, is being held in collaboration with the Department of Agriculture. Activities celebrating the mangoes on Nevis commenced on July 03. The event is an international culinary event hosted by the NTA during the month of July. The last activity is scheduled for the coming weekend. Its key activities involves three international chefs have been bringing together visitors and locals to sample the culinary delights of local and international chefs using mangoes, a fruit found in abundance at this time of year in Nevis.